There have been football books which have told their tale through the partisan heart of a besotted fan, and those that have dissected their subject through the scientific mind of an objective writer. But rarely does one fuse the blind passion of a lifelong supporter with the cold eye of an award-winning journalist in the way 44 Years With The Same Bird does. That bird is the Liver Bird, and on the surface this book is a pitch-side view of the entire modern era of Britain's most successful football club. 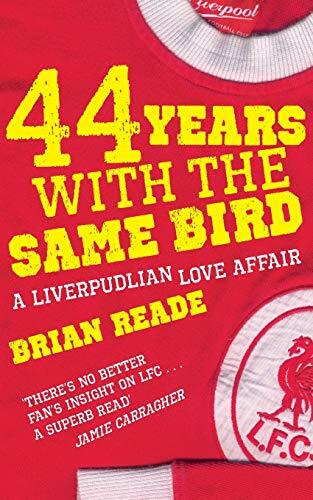 It is Brian Reade's take on the extraordinary stories behind the 48 trophies he has seen Liverpool lift since watching them en route to their first ever FA Cup win in 1965, right through to the Champions League defeat in Athens in 2007. It takes in all of the big nights that propelled the club to five European Cups, three UEFA Cups, twelve titles, countless domestic cup triumphs, bitter failures, the tragic disasters in Sheffield and Brussels, as well as the barren years of the late 60s and the 90s. But the book goes far deeper than that. It's about how football allowed a father who was separated from his son to forge a precious bond. How a football club can make a city that is dying on its knees keep believing in itself. How you should never, as a professional, get too close to your heroes. How being part of a disaster at a football match (Hillsborough) can leave you a mental wreck, unwilling to carry on, but how witnessing a miracle on a football pitch (Istanbul) makes you realize that no matter how low you sink, you should never give in. Brian Reade is an award-winning journalist who has two columns, one of them about sport, in the Mirror. In 2000 he was named Columnist of The Year at The British Press Gazette Awards, and in 2003 was named Sports Columnist of The Year in the Sports Journalism Awards.